It can be supplied in rolls, tube or cut forms. 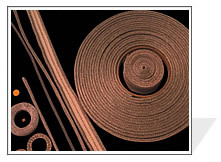 Material available: Stainless steel wire, galvanized iron wire, red copper wire, phosphor bronze wire, nickel wire, polyamide fiber, polyester fiber, F46 fiber, metal wire and mixed fiber, etc. Application: In distillation, absorption, evaporation, filtration in the process of petroleum, oil refining, chemical industry, light industry, pharmacy, metallurgy, machinery, ship-making, automobiles and tractors, to delete the mist drop or liquid foam in air, also used as air filter in cars and tractors.